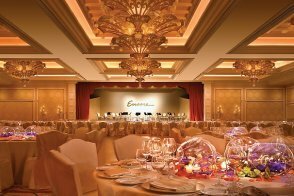 Style is at the forefront of this hotel, which boasts a signature butterfly motif, high-energy music throughout the property, and nearly 130 ruby red, hand-made Italian glass chandeliers. 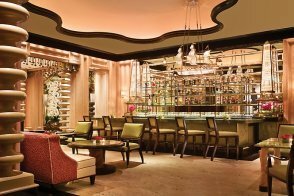 Perhaps the best examples of this hotel’s unique style are found in its nightlife offerings. 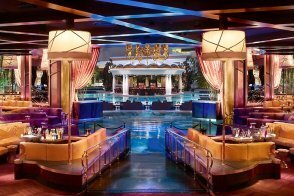 At XS, one of the most expensive nightclubs ever built, gold glimmers as far as the eye can see. 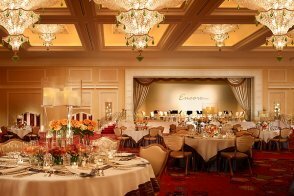 Also not to be missed: the Encore Players Bar, home of 150 flavored vodkas. Which one will you try first? Ready to soak up the desert sun? 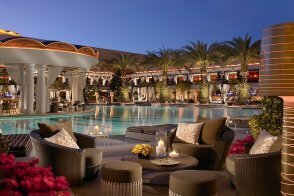 Look no further than Encore’s chic outdoor pools. 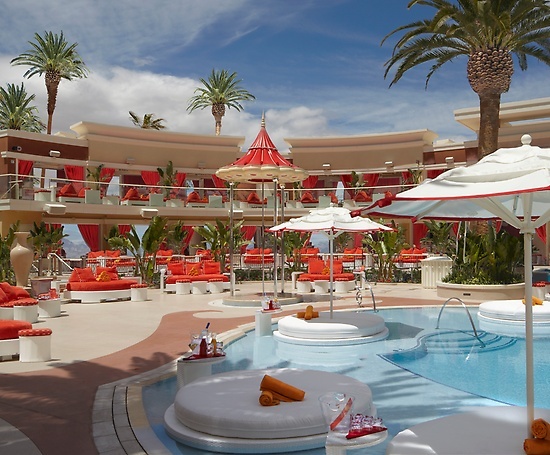 They’re secluded, adults-only, and bursting with fun - especially at Encore Beach Club. For more privacy, consider renting an impeccably furnished cabana, with mini-fridge, plasma TV, and plush chairs and sofas. 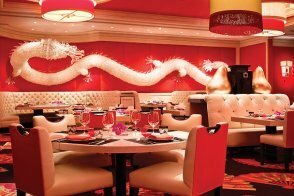 All that partying will make a reveler hungry, and in addition to easy access to all the amazing dining options at the Wynn, you’ll find five signature restaurants, including fine Italian dining at Sinatra, pan-Asian cuisine at Wazuzu and more. Suites at Encore are also dressed to impress, with Italian marble bathrooms and wall-to-wall windows with sparkling city views. 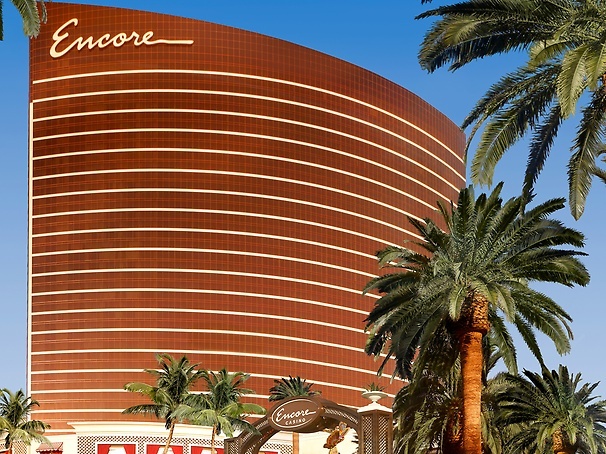 Amenities include glass-enclosed showers, pillow-top Wynn Dream beds, and high thread-count linens. It doesn’t get much more swanky than this. No, but there is a race and sports book at the adjacent Wynn Las Vegas. Yes. Italian restaurant Sinatra, the Pan-Asian café Wazuzu, Jardin, Goodies on Demand and the unique dining and nightlife experience in Andrea's. 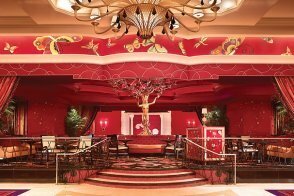 Le Rêve - The Dream is the featured show at Wynn. 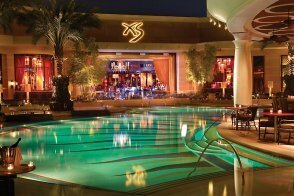 One of the hottest and largest nightclubs in Vegas is XS, along with the indoor/outdoor Encore Beach Club. 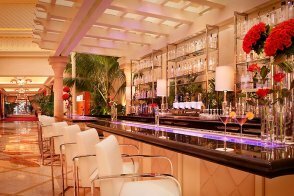 There are several bars at the resort including Eastside Lounge, the Lobby Bar and Cafe and Encore Players Bar, a hot martini mecca. There is a sunlit atrium at the property's main entrance and fine art throughout. Yes, a European-inspired pool area. 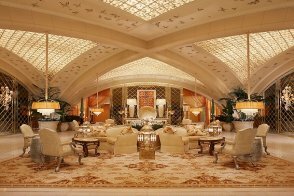 Yes, The Spa at Encore and the Claude Baruk Salon. 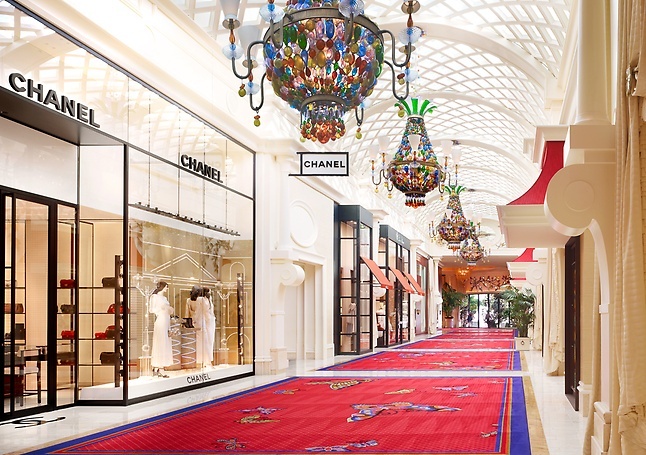 Yes, the Esplanade at Encore has several designer boutiques. Concierge, currency exchange, same-day laundry service, luggage service, maid service, safety deposit box, wake-up call. Yes. 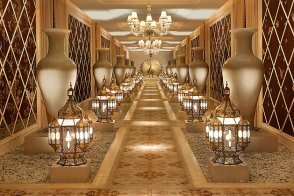 For hotel guests, the parking fees will be included in your resort fee. 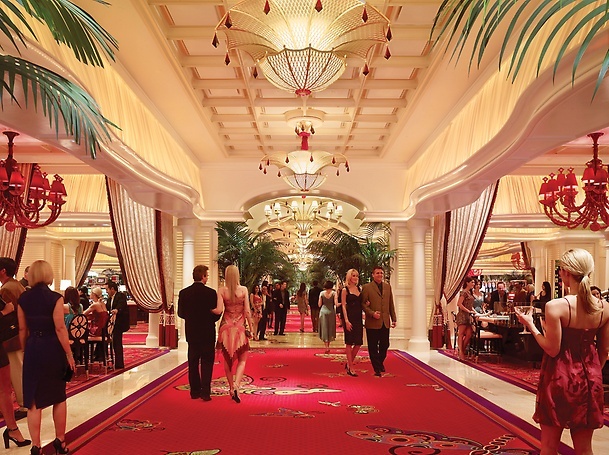 For non-hotel guests and local residents, self-parking and valet parking will be validated once per day, per vehicle, upon receipt of any $50 spend within Wynn or Encore. Self-parking fees: Up to 1 hour: no charge, 1-2 hours: $7, 2-4 hours: $12, 4-24 hours: $15. Valet parking fees: Up to 2 hours: $21, 3-4 hours: $24, 5-24 hours: $30 (each additional 24 hours). Hotel requires a credit card upon check-in for incidental charges. 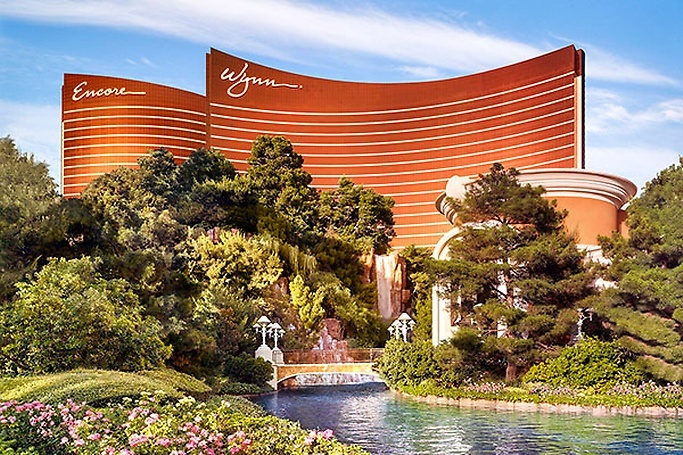 Resort fee Encore at Wynn Las Vegas has a $52.38 per room, per night resort fee. This fee is not included in your reservation and will be collected by the hotel. In-room Internet access. Guest has the option to upgrade for faster speed based on their needs. Upgrade can be purchased at check-in or at anytime during their stay from their device after registered to the Internet. Internet prices: Max 7MB- included in the resort fee; 7.1MB-12MB- $7.99 for 24hour per device; 12.1MB-20MB-$14.99 for 24hour per device. Unlimited local, domestic long distance and toll-free phone calls. Fitness center passes (two per day). Resort fee listed does include tax. This 698- to 745-square-foot suite offers a king-sized pillow-top bed with overstuffed pillows and shams plus a sitting area with a sofa, desk and 42-inch flat-panel television. These suites have a view of the Strip or downtown Las Vegas through floor-to-ceiling windows. 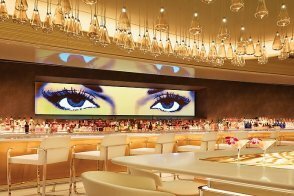 Other luxurious amenities include one-touch climate control, a gourmet minibar, state-of-the-art office equipment and signature Wynn Resorts robes. Guests in the Tower Suite also enjoy a dedicated check-in area with VIP concierge service and exclusive pool access. The bathroom features a separate soaking tub, a glass-enclosed shower, private toilet with telephone, his-and-her sinks, sitting area with vanity mirrors and flat-screen TV. 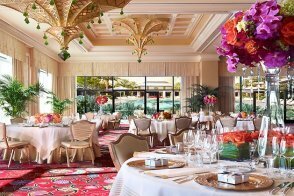 Daily breakfast (available from 5AM - 12PM) menu for two (2) guests at Tableau, Terrace Pointe Cafe, The Buffet, Jardin, Goodies on Demand or Drugstore Cafe. At 1,408 square feet this suite offers a bedroom with a king or two queen pillow-top beds that come with overstuffed pillows and shams, 507-count, 100 percent Egyptian cotton sheets and luxurious bedding. There is a 52-inch flat-panel television in the living room and a 42-inch flat-panel television in the bedroom. The living room has a couch, table and chairs. 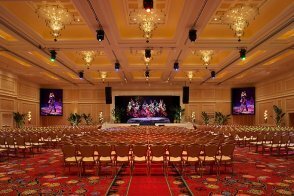 Along with a massage room, other luxurious amenities include one-touch climate control, gourmet mini bars, state-of-the-art office equipment and Wynn Resorts signature robes. 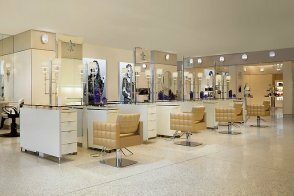 In-room massage, manicure, pedicure and hair styling services are also available for a fee. The bathroom features a separate soaking tub, a glass-enclosed shower, private toilet with telephone, his-and-her sinks, sitting area with vanity mirrors and 19-inch flat-screen television.The bathroom features Bambu bath amenities and oversized Turkish towels. At 700 to 745 square feet this suite offers a king-sized pillow-top bed with overstuffed pillows and shams plus a seating area with a sofa, desk and 42-inch flat-panel television. 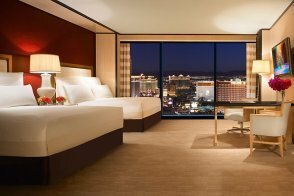 Located on floors 7-30, these rooms have a view of the Strip or the pool through floor-to-ceiling windows. 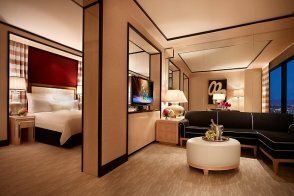 Other luxurious amenities include one-touch climate control, a gourmet minibar, in-room safe, state-of-the-art office equipment and signature Wynn Resorts robes. The bathroom features a separate soaking tub, glass-enclosed shower, private toilet with telephone, his-and-her sinks, sitting area with vanity mirrors and flat-screen TV. At 700 to 745 square feet, this suite offers two queen-sized beds with overstuffed pillows and shams plus a seating area with sofa, desk and 42-inch flat-panel television. 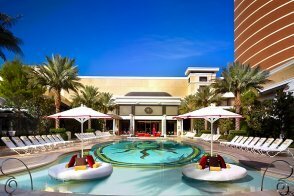 Located on floors 7-30, these rooms have a view of the Strip or the pool through floor-to-ceiling windows. 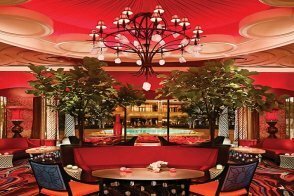 Other amenities include one-touch climate control, gourmet minibars, state-of-the-art office equipment and signature Wynn Resorts robes. 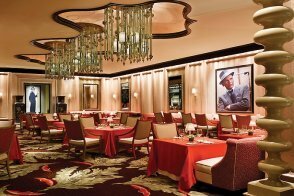 This 2,261-square-foot suite has a king-size Wynn signature bed and adjoining entertaining and bedroom areas. 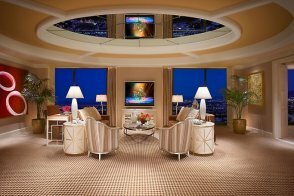 The suite offers floor-to-ceiling views of the Las Vegas cityscape as well as a massage room, wet bar and two closets. Other luxury amenities include one-touch climate control, a gourmet minibar, a dining table and chairs and three flat-screen televisions. The bathroom comes with an assortment of deluxe bath goods, a sitting area with a lighted vanity and a separate shower and soaking tub. This suite is either 700 square feet with a view of historic downtown Las Vegas or 745 square feet with a view of the bright lights of the Las Vegas Strip. The room has a king-sized pillow-top bed with overstuffed pillows and shams, floor-to-ceiling windows and a sitting area with a couch and ottoman. 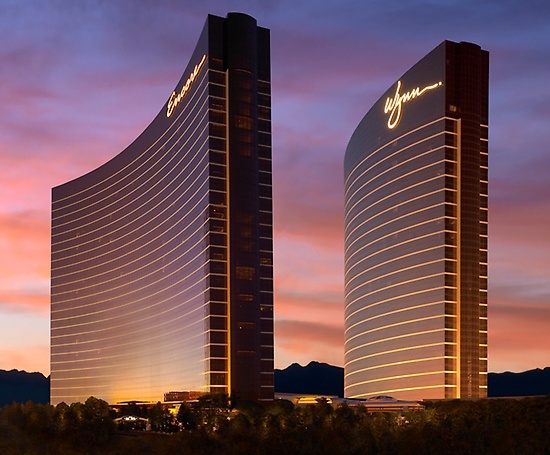 Other amenities include a 42-inch flat-screen television, one-touch climate control, state-of-the-art office equipment and signature Wynn Resorts robes. In-room massage, manicure, pedicure and hairstyling services are available for a fee. The bathroom has a 19-inch flat screen television, bath amenities, dual sinks, a sitting area with a lighted vanity mirror, a separate shower and soaking tub and separate water closets with telephones.